Kaysons Education provides you with the best IIT JEE questions practicing platform. Covering maximum type of questions including Single choice, Multiple answers, comprehensive and Interger type questions. Our analysis section help you find out topics you are weak in. 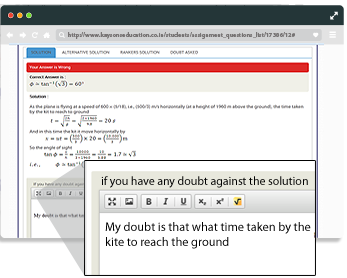 You can ask doubts against the solution of questions as well. You discussion questions with friends. Now you can do that with a community of over 12000 students. who have asked over 40000 doubts against 30000 questions at Kaysons Education. Only company that provides different type of Question Practicing at the same platform. Have you ever wondered how a particular step in the solution has come? 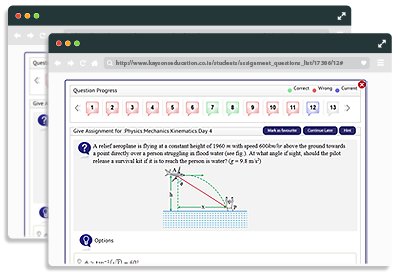 At Kaysons Education we provide you with 30000 questions to practice and if you have any doubts against the solution you can ask. Over 40000 doubts asked against 30000 solution by over 12000 students.. Yes you can view them ALL! Knowing your weakness is the biggest strengh. At Kaysons Education we believe that if a student knows the topics he is weak in he can work more on that topic to improve it. "Topics you are weak in" help you do just that. 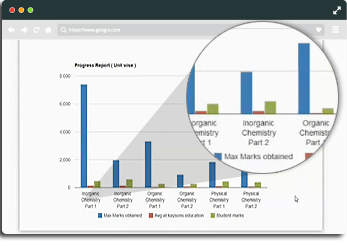 Report too like maximum question practiced, Maximum Marks getter, Correct questions practiced. 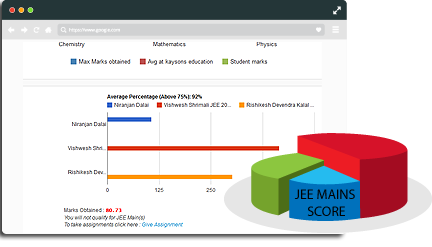 helps you compare you performance with other students giving you a sense of competition you are about to face. Wondered what your JEE Marks will be ? At Kaysons, we analysis the questions you practice and giving you a approx. figure on what marks you can score. Every time you practice questions your marks optained is updated. Last year ALL the student we predicted will get above 150 in JEE mains all cleared their Mains. Remember the prediction is based on the questions you practice.